RétroCiné (Grandpa's Cinema) by Jeannick and Pierre Michel got a 4-star award at BIAFF 2009. 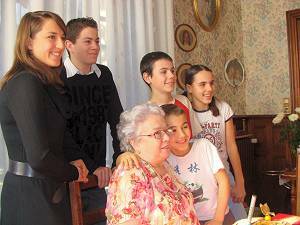 Jeannick Michel and five grandchildren. Jeannick is a former professor of mathematics in the final classes of high school. 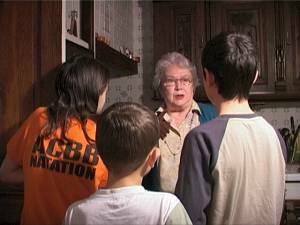 She has been making amateur movies since 1959, when she married Pierre who gave her the "virus". Pierre has a PhD in Mathematics and is a former university professor who has, since 1956, been using his small French 8mm camera. So you will understand why the Michels were a " maths and film " family and why their children, both engineers, and grandchildren, were also hooked on amateur film. Please note the "amateur" because this has always been a hobby and only that, even when Jeannick led the volunteer camera club in each of the two schools where she taught. But apart from these two interests, we have many others. Cooking and sewing for Jeannick (which is good practice for making the costumes of some of our films: middle-ages, 1900s or Westerns). Antiques (useful for movie props). Reading for Pierre (he gulps books down!) ... not forgetting the pleasure of sharing time with our five grandchildren. In fifty years we have made a hundred movies in 8mm, super-8mm and over the last fifteen years on video. Our children: Serge (who has long been Vice President of UNICA) and our daughter Sylvie, and our five grandchildren have often been the actors in our films. Serge also did the camerawork for our filming. He also has a dozen films to his credit including Le Conte du Soir (Tale of the Night) which won a bronze medal at UNICA in Argentina in 1994. For some time we have wanted to conserve the work of past amateur filmmakers. Although we have already done so, in 1983, with a film about the history of cinema and in 2000 a report of a visit to our little museum of cinema, located in the basement of our house, we believe that since the variety of projection materials is so large, it is urgent to preserve the work for the future. Among the 200 projectors in our collection, we had plenty of choice! We decided this time to use one of our first sound projectors. And to display it, what could be better than showing the transmission of knowledge from grandfather to grandchildren. Thus a double aim could be achieved: to preserve a heritage and make a family film. As three of our grandchildren were on holiday with us and they are very used to performing in our films, we decided to make this film with them. Some years ago, Pierre had written a synopsis that he decided to adapt once the old film was chosen. As we never make a story-board, we proceeded as we have always done for 50 years: we write down key moments and key phrases for the film and then allow our actors to improvise. So we did this once again and, as we wanted to retain the spontaneity of the children, we decided to treat it as a story, avoiding any unnecessary artifice. The scene takes place at 5pm in winter. So it is dark. The 3 kids root around in the attic. An exclamation: - "Look, what is that?" (a box containing yellow spools). The 3 heads turn and Charlie opens the box. Alexandra: - be careful. It would be better to ask grandpa what it is. 3 arrive in the dining room: - grandpa, we found it in the attic. Grandpa took the box and examined it: - these are the first movies your grandmother and I made. Oh, that's The Little Snail that had Good Heart - a movie with your mom and uncle Serge. The 3 - Oh, grandpa, will you show it to us? Grandpa (a bit gruff): - I would have to search all the equipment. It has not been used for 30 years. 3 (pleading): - Please, grandpa! Grandpa: - But I do not know where this stuff is. Perhaps granny knows. The 3 rush to ask their grandmother. They return: - She said it was in office. Grandpa: - Ah yes. Charlie take a look. Charlie returns with the projector, but it's missing the tape. This time Alexandra goes looking. As for Arthur his job is to ask granny for a white cloth ... not to do the dishes but for use as a screen. Finally we project the film in which we see their mother at the age of one month disguised as a small snail, which will be transformed by a good fairy into a lovely little girl. Arthur did some thinking aloud which makes his brother and sister shush him. At the end of the film the children ask to see others. This will be for tonight with their grandmother. Arthur then whispers in Charlie's ear. He responds : tell him yourself. Arthur goes to his grandfather: - Grandpa you know, we don't make children that way nowadays ! Note that we did the film about the small snail when our daughter was born in 1965. The scene was set in a corner of the room. Before each feeding, we dressed our little snail and we took a scene in "stop motion". The shooting lasted about two weeks if memory serves. Filming RétroCiné went even faster since, apart from a couple of cutaways, 2 hours of raw footage were recorded in one day - 2nd January 2008. As you have seen above, very little dialogue was written. It was the children themselves who suggested the words they wanted. For example, the attic scene was totally spontaneous: When they went to the attic, they did not know what they would find and it was Arthur who, discovering the bowler hat, began to mimic Charlie Chaplin. From this discovery, the scene was shot several times to record perfectly the setting and actors. As usual Jeannick is holding the camera (except of course for shots where she appears). The camera is a SONY DCR-VX 2000 E and everything was filmed using ambient light and the sound recorded by the microphone on the camera. Supporters of true amateur filming, we have always been - and we remain - convinced that we can achieve good results without trying to imitate the "pros", and by keeping things simple. We believe that editing plays the major role in the final result and that is why, though the shooting had taken one day, the editing lasted a good month. After an initial scan of the rushes, a first assembly is carried out. From there each image or sound is studied, refined, left for a while to be checked after a few days. The inserts are incorporated in the right places. We started working this way when we were shooting the film with Super-8 sound and we must admit that digital editing - in our case with a Macro System Casablanca - greatly facilitates the work. The film is thus examined by both of us a good fifty times before moving to the music which is always Jeannick's choice. That left the English subtitling to be done. Our translation was overseen by our friend Reg Lancaster at UNICA in Tunisia and we must thank him for this assistance. Then we had to insert subtitles and here Pierre was very fussy. He recognises, what many filmmakers, even professionals, forget : that when there is a change of scene while a subtitle is shown, the viewer starts reading the sentence from the beginning again, which is very unpleasant. We must therefore divide a sentence, which may be too long, so that its parts are split over two consecutive shots. We also decided to assign a colour to each speaker for ease of understanding, but only the English can say whether we achieved our aim. So what can be said about the success of our film ? In fifty years of movie making we have never deviated from these principles that have enabled us to make films which are appreciated. We love simple cinema without the excesses of special effects stemming from today's software which often hides a lack of thought. Some may think that the beginning of the film could have been shortened, others that the old 8mm film might not need to be shown in its entirety ... Those who really understand know the choice was ours and it was made after careful consideration. In a world where everything is accelerating, can't we sometimes follow the whims of a simple story? The feedback we have had shows that, for most viewers, our choice was the right one. - if you pick them in your very own garden." - Jeannick and Pierre Michel, Redon, April 2009.